Space Exploration Video Art Course - You ARE an ARTiST! Special Introductory Price! 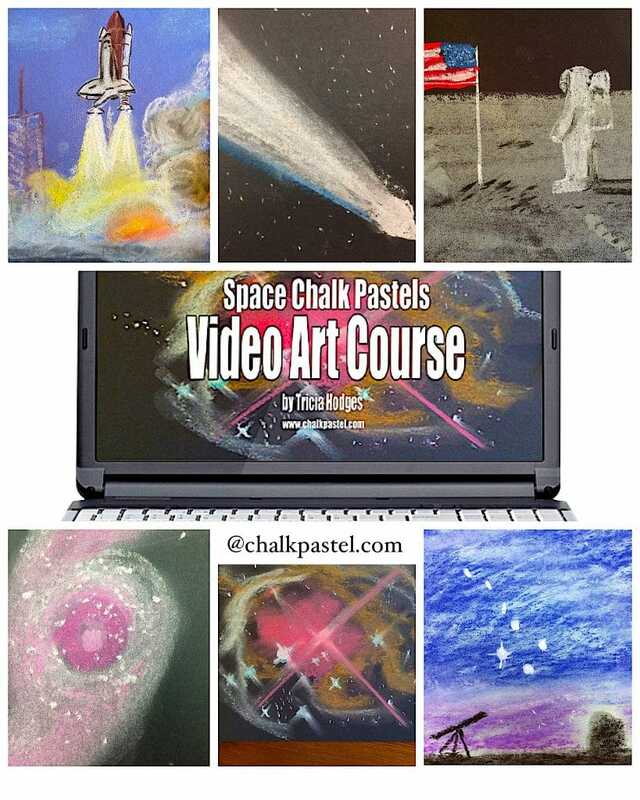 Explore outer space with six chalk pastel video art tutorials for one, low price! 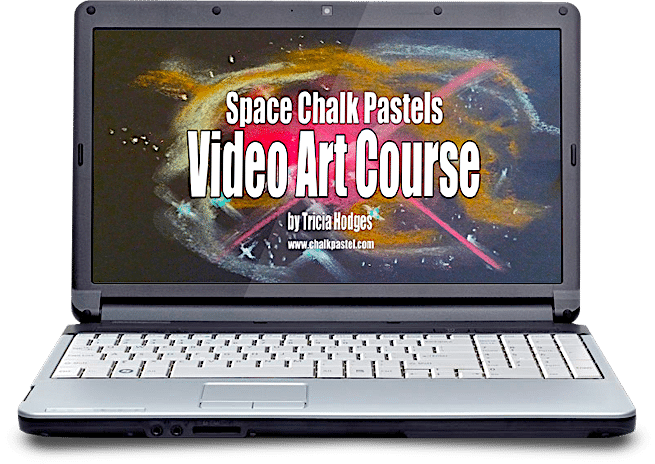 Space Exploration Video Art Course is for beginning or continuing art lessons in the chalk pastel medium. Whenever you look up in a dark, night sky what do you see? Ah, when I was a child, I used to think that the night time was just a shade that God pulled down over the day and the stars were little pinpricks of light that shone through the shade. But you know better! There are wonderful sights for us to see and paint in space! You can pick up your brightest orange pastel and give it a twist with your fingers in a circle, and, there you have the planet Jupiter, glowing in a darkened sky. Then an oval of palest blue pastel and you have the famous rings around this planet. There is so much to explore in the night sky. Space IS the final frontier! Our sun shines brightly on these planets. Maybe one day, you will be adding your footprints on the surface of our moon? The possibilities are endless – all because you ARE an artist! This the first chalk pastel video course and ebook the children and I have developed on our own. Why is that important? Well, since we have been enjoying chalk pastel tutorials since 2010, we have been learning that we ARE artists. Nana has been encouraging us and leading in most of the chalk pastel tutorials. We now have the confidence to boldly step out and create tutorials on our own because of our practice with chalk pastels. And we are so pleased to share all we have learned from Nana! Chalk pastels — available online or from any art store for less than $10 for a starter set. You will use quite a bit of white chalk pastel sticks. Ours were just little nubs of pastel when we finished. You might consider getting a package of just white chalk pastels if more than one artist in the family is using this course. Paper — You will mostly use black construction paper for this course. Copy or computer paper you have on hand for just a few tutorials as well. Spiral Galaxy from Chalk Pastel on Vimeo. Each lesson includes an overhead view of Tricia and the children leading you through, step-by-step. Homeschool mother of five, Tricia thought she didn’t inherit the art gene from her mother. But as she watched Nana teach her children she started building up the courage to try chalk pastels herself. All it took was practice and both the Easter Art for All Ages and Art in Space digital art curriculum were born! Yes, chalk pastels are such a fun and successful medium. 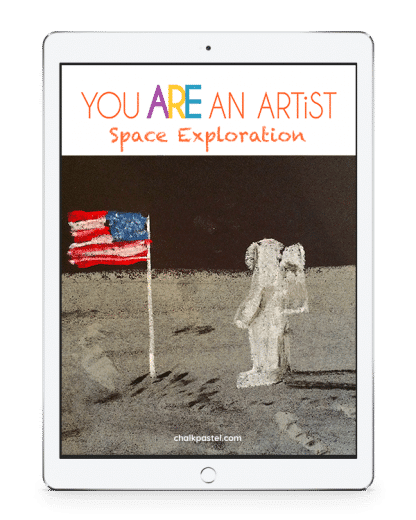 Start your journey through space – with art – today!